Yesterday, Tuesday February 15, we cruised only 6 miles up the Rio. We did so at just above idle power, but even at 4 knots it seemed way too fast. The river is clean and clear visibility in the water to about 8 feet. Thus far, it has varied from 50 to 300 yards wide, with depths ranging from 15 to 90 feet. The first six miles of the river are bounded with near vertical to vertical walls perhaps 500 feet high and covered with a wide variety of plants, bushes, trees and vines. 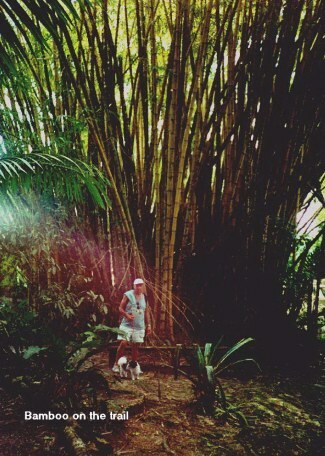 We were told that many of the early Johnny Weismuller (Tarzan) films were made here. Some of the vines dangle freely hundreds of feet. The river is the only mode of transportation for many miles. 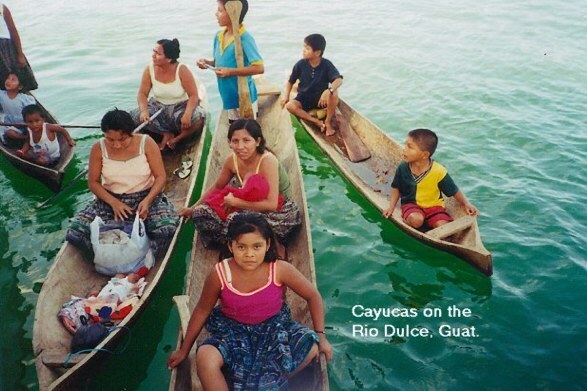 It is trafficked with all manner of boats, but mostly our favorites, the cayucas or dug out canoes. They are carved out of solid logs to a uniform hull thickness of around ¾ of an inch. Some cayucas are 25 feet long. The children have canoes around 6 feet long. Very few cayucas have outboard motors, mostly they are paddled. When school is out, children as young as six years old are out on the river fishing, swimming and visiting friends. The indian women routinely do their laundry on the rocks of the river bank. The men fish with hand lines or throw nets and the nets are enormous, 20 to 25 feet in diameter. When the nets are thrown, they nearly throw themselves out of the 2 foot wide cayucas. Even though there are risks at swimming in the water from liver flukes and shiztosomysis (spelled wrong I'm sure), which diseases area propagated by the river snails, the indians are in the water all the time. But I have to admit that you see very few old indians. The Kek'chi Mayan men and women are very attractive. They are truly friendly and giving even though they have next to nothing. Over the last 75 years these people have suffered terrible hardship. I don't know the details, but in just the last 15 to 20 years over 20,000 were killed in the mountains and driven from their ancestral homes. They were hunted as terrorists even though for the most part they weren't responsible for the trouble. 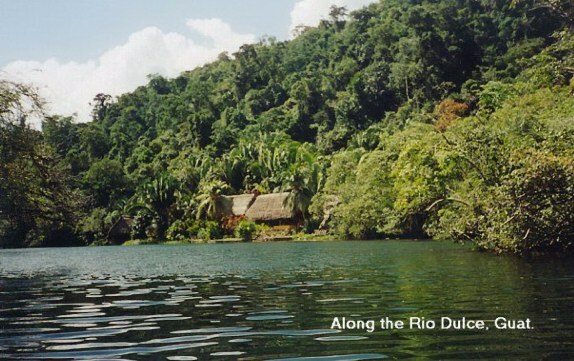 Here on the Rio, there are an estimated 5000 indians who have made this a permanent home after having been routed from the Peten region, north and west of here. They come from several tribal origins including Mestizo, Maya, and Kek'chi Mayan. I think that they are pretty well mixed now. The government has stopped abusing them and there is, I think, new respect for their rights. Today, Joan and I saw a young man, his wife, two 3 to 4 year olds and a baby in about a 14 foot cayuca. I motioned them to come over to Francesca and asked if they wanted some clothing. On board Francesca we had 5 large boxes of my late mothers clothes graciously donated by my Dad (thanks Dad, there could be no greater appreciation). By the time they left, we had loaded their cayuca down to within a inch of sinking. Joan asked that they distribute the clothing to their friends and family. Later this morning, with the Heides, we took the dinks up the nearby tributaries, the Rio Tatin and the Rio Lampara. There were several indian settlements and lots of really pretty scenery. Six or eight miles up the Lampara, there was a small cattle farm and every so often there would be a little patch of jungle cleared for a garden. We also got a clear view of the high mountain range just to the south. The tops of the mountains being perpetually in the clouds. For lunch, we stopped at a river bank restaurant, thatched roof of course, and the lady whipped up spicy camarones (shrimp). Returning to Francesca around 2:30 PM, there were several cayucas roaming around. Yup, word gets around. Every boat had mom and pop or sometimes two women and at least one child. They came by one by one and very politely said buenos dias. Joan and I decided it was time to clean out our closets, hand out packages of pencils and pads of paper and anything else that we didn't need, but they could use. We must have given stuff to two dozen indian families before the well ran dry. It was sad to see the faces of those we had to disappoint, but there were so many happy faces. In the early morning, there are very low clouds over the river, but by mid morning they burn off and it is sunny. Then, so far every night, between 1:00 and 5:00 AM it rains. In fact it pours, 1 to 2 inches or more and this isn't the wet season. I forgot to pull the plug on the dink last night and this morning, hanging on sagging davits, the dinghy had water to within 4 inches of the top of the transom. Today we are going to shut down the watermaker and begin collecting rain water with a tarp that was purchased just for the occasion. It should be possible to collect 50 to 100 gallons a day. We plan to move further up river today and into Lago (lake) El Golfete. This, the first of two lakes and is about 10 miles long and 2 to 3 miles wide. The cruising guide describes all kinds of attractions and we hope to visit them all.